RBI Grade B 2017 – RBI Grade B Officers Notification, Exam Date, Online Application Form: RBI Notification (1/2017-18) for Recruitment for the post of Officers in Grade 'B' (General) Direct Recruitment - (DR) in Reserve Bank of India announced. The much awaited Bank exam notification of the year finally announced. Are you looking for RBI Grade B Officers notification? Recruitment of Grade B Officers in Reserve Bank is finally issued by Reserve Bank of India. Here is everything you need to know about RBI Grade B Officers (General) exam 2017. 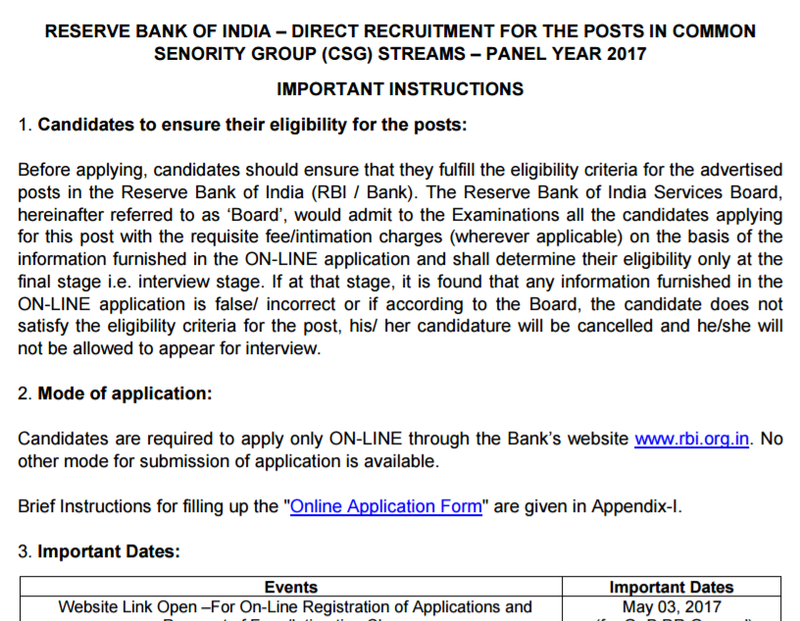 RBI Grade B Officers Notification 2017 Officially out. The Reserve Bank of India (RBI) conducts Grade B Officers exam once a year. Here we have come up with complete details about RBI Grade B Officers 2017 such as notification, advertisement, exam schedule, exam date, online application form, syllabus, exam pattern post details and more. The Reserve Bank of India (RBI) is to hold an all India Examination for recruitment to the post of Grade B Officers in Reserve Bank of India. Along with fresh recruitment notification of Grade B Officers in Generalist, it also announced recruitment of Grade B Officers in specialist. Since last few months, there were rumours that RBI Grade B Officers Notification will be announced. And it became reality now as RBI has finally announced total 161 Manager posts of Grade B Officers vacancies in Reserve Bank of India. All we have the RBI Grade B Officers Exam 2017 notification. Graduation in any discipline from a recognised University or any equivalent qualification recognised as such by the Central Government for Grade B Officers (Generalist) while some extra qualification needed for specialist posts. The Examination will comprise of Online Examination in two phase; Preliminary and Main. The Reserve Bank of India (RBI) has uploaded the tentative dates, exam dates, notification as well exam schedule for all its exams for the year 2017. There are total 161 vacancies available for Grade B Officers posts under this recruitment notification. That’s good news for Bank Exam Aspirants. A minimum of 60% marks (50% in case of SC/ST/PWD) or an equivalent grade in Bachelor’s degree as well as in 12th (or Diploma or equivalent) and 10th Standard examinations is minimum eligibility to apply for RBI Grade B Officers exam. If you are looking for more details of RBI Grade B Officers 2017 Notification for detailed information about notification, exam dates, number of vacancies, online application form, how to apply online and other details, keep in touch with our next posts. Download RBI Grade B Notification.